Try Zucchini & Eggplant Bruschetta Boats for a tasty twist on a classic. We'd love to know who first looked at zucchini and eggplant and thought of boats, but they sure are tasty vessels. 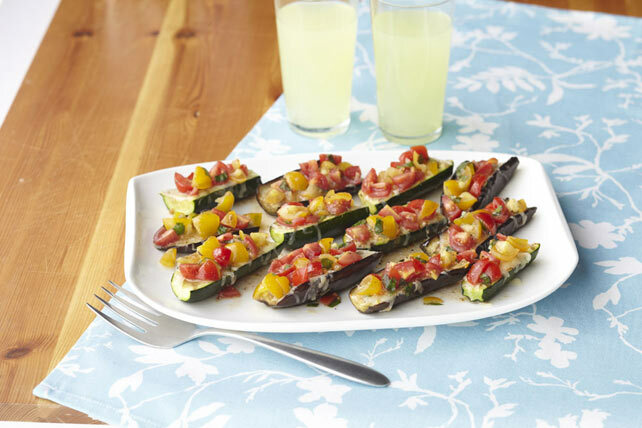 Zucchini & Eggplant Bruschetta Boats grill up quickly for a perfect barbecue side dish! Toss tomatoes with 2 Tbsp. dressing. Cut zucchini and eggplants lengthwise in half; brush evenly with 2 Tbsp. of the remaining dressing. Grill, cut sides up, 12 min. or until tender, turning and brushing with remaining dressing after 6 min. Turn cut-sides up. Top with cheese; grill 1 min. or until melted. Transfer to platter. Add basil to tomato mixture; mix lightly. Spoon over grilled vegetables; cut in half. Chinese eggplants are often labeled as either Asian or Japanese eggplants. Look for these thin long eggplants in larger supermarkets. Prepare using only red cherry tomatoes. Grilling these vegetables adds delicious smoky flavor to this finished dish.